. 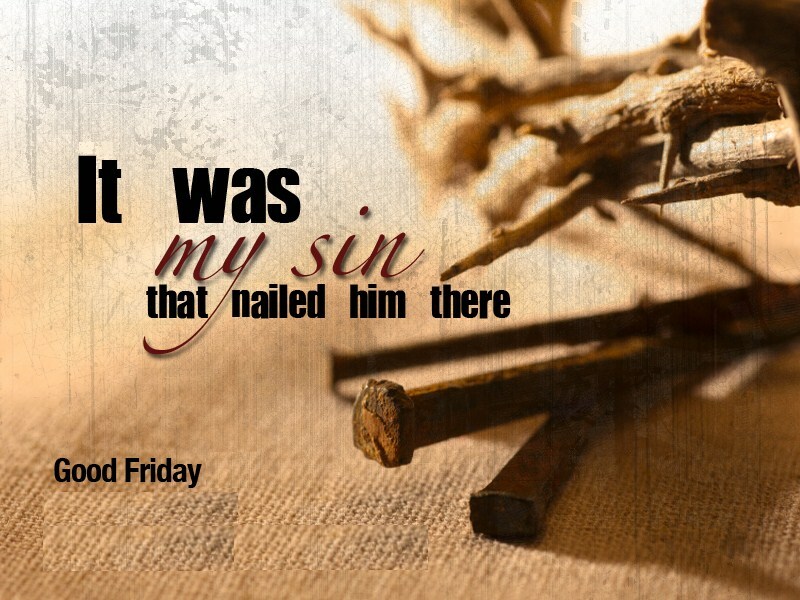 . . and it was his death that wiped away my sin. he has covered me with the robe of righteousness . . .
Because of his sacrifice I am free. I no longer need to hang my head in shame, guilt or condemnation for all the “yuck” in my life. He has placed his hand beneath my chin and lifted my head to look directly into his eyes of love. Yes! He has invited me into his very presence to partake of sweet fellowship with him. Are you running from God? Do you think you have to be perfect before He can love you? Are you working to earn His approval? Here is my hand up in the air – been there, done that! But you don’t have to live that way. It really is as simple as accepting the forgiveness he offers you, then turning away from the past and moving in a new direction. He longs to come alongside you and strengthen you to live a new life, a life filled with an abundance of peace and joy, even in spite of outward circumstances. Believe it! This is Easter weekend, a time of new life and new beginnings. If you haven’t been to church in awhile I want to encourage you to find a good Bible-believing church and give it another try. I know that some church people are really messed up. Isn’t it good that they (we) have a place to go and learn to live better? If you’ve never been to church at all give it a first timer’s try. Go with an open and expectant heart. God does not disappoint! As mentioned in a previous post, I’m going to participate in my first ever craft fair this upcoming summer. I’m kind of nervous about it. I don’t want to make too much of any one item and get stuck with a lot left over. I also don’t want to make too few of any one item because, if I sell out, I’ll always wonder if I should’ve made more! So silly, I know. I blogged last year on The French Flea at the Queen Bee. It was the first French Flea Market in our area and the quality of items sold was simply amazing. You can link back for a peek at what shoppers have to look forward to. This is the fair I’ll be joining in September. In my post Old Buttons and Lace, I shared a tutorial on decorating old bottles with . . . well . . . old buttons and lace! I’ve made several more here that I hope to take to the fair with me. I painted the bottles I collected in ASCP Old White and Graphite, and distressed them with sandpaper. Then I began adding materials found at thrift stores: old crocheted doilies, lace, buttons, vintage necklaces, earrings and the like. that I embellished with lace, an old brass earring and a pearl on top. This bottle had beautiful color so I chose not to paint the entire thing. I added some tea stained sheet music as a stopper and some vintage earrings to the front. Here it is displayed in a window to show off the color. These twin bottles were a fun find. In addition to the lace I added some handmade rosettes (tutorial here) and lock and key charms. These bottles show off a variety of laces and torn fabric strips used in the project. This one has miniature rosettes all around. This bottle has a raised grape pattern that shows through nicely after sanding. I again used sheet music as a stopper and another strip peeking out from under the lace, then added a vintage rhinestone earring and more rosettes. I scalloped the edge of the sheet music and crumpled it up before adding it to the bottle. All of the bottles have flowing ribbons cut from scrap fabric and lace. I was lucky enough to find a huge bag of old lace in the craft section of the thrift store that I aged even more in a tea bath. This last bottle received a British crown via The Graphics Fairy and a vintage earring jewel. All of the bottles were simply created by cutting fabric, lace, crocheted pieces and randomly gluing them in place until something inside said it was enough! Now to figure out how much to charge for all the items I’ll be making, how to display them, what I need to bring to package things up for people, do I get a charge card APP on my phone?, etc., etc., etc. I really wish I knew what I was doing, but I guess it will be another chance to stretch myself. I’ve been doing a lot of stretching lately. Thankfully, I’ve talked one of my friends into coming along and sharing a booth with me (Thank you Linda). There is comfort in shared discomfort, ha ha! So, what about you? Have you taken part in any flea markets or craft fairs before? Any advice, tips, wise words, warnings? Anything at all? I’d love to hear! That is what my parents always called St. Patrick’s Day when I was a child. No wonder it felt like such a special day and that I felt so closely tied to my Irish heritage. Even though I am an American mongrel and have more Finnish blood than anything else, I loved having a day named just for me. This was just one of the ways my parents made me feel special. My parents are both gone now but this little guy always reminds me of my dad. A tradition that began once my parents had grandchildren was for each grandchild to receive their very own leprechaun from my father. He waited until they were old enough to understand and then he gave them their leprechaun with a secret name. The name was never to be told to anyone else and known only to each individual grandchild and their Poppy. I am the baby in a family that was spread out over many years so my own youngest child was only an infant when her Poppy died. He didn’t forget her though and when she was old enough my mother gave her the leprechaun that was set aside just for her. My girls still remember the names of their leprechauns and they still hold their secret names to themselves. What a wonderful tie to their Poppy and their Irish heritage. I was having tea with a friend this week and we came across this tea from Ireland that I simply couldn’t pass up. I still have both of my in-laws and since my mother-in-law is Irish and loves tea I had to buy this as a gift for her. Gift of the Gab! What a great name for a tea shared with a few women. And here is a little Irish gal that I printed from The Graphics Fairy to add to my St. Patti’s Day decor. Her eyes are green just like mine! That was another thing that made me feel especially Irish as a child. No matter what your heritage St. Patrick’s Day is a day for the wearin’ o’ the green (unless you’d like a good pinch). I’ll be cooking a traditional meal of corned beef and cabbage and enjoying the feeling of having had parents that loved me so much that they named a day of the year just for me!